So LinkedIn told me it was my 3 year workiversary the other day. 3 whole years since starting with Fluency Communications and building out their National Next Gen Network. 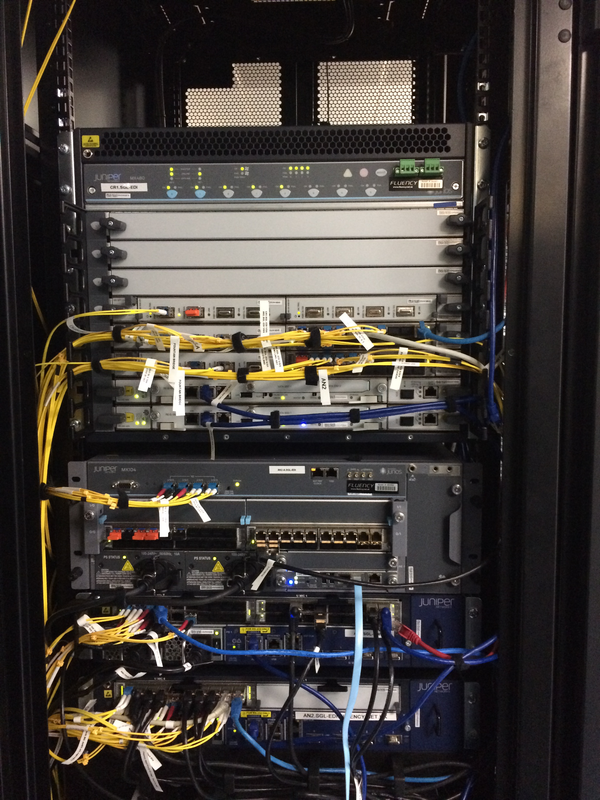 When I first joined the company, the network was ran on 3 Vyatta boxes and a few 100M circuits. From there we started the upgrade process to Juniper MX5 routers and some 1G links. We required to have a box that would scale not only in performance but features. The MX5 can be easily unlocked from a 20G line rate box up to an MX10 giving 40G line rate performance with a simple license install (and further if you want). For us, EVPN is looking like a no brainer upgrade from VPLS with its control plane learning and mac learning/filtering with the use of policies. Sometimes it seems the possibilities are endless! We have now outgrown the MX5/10 as our core router and we are now in receipt of some shiny MX480 routers (see below picture). We have also taken the decision to go single vendor, which up until the last year or so I always had an inherent distrust of but seeing the flexibility of the MX platform has removed that mental stumbling block and we are now using the MX104 at our access edge for customer connections rather than our previous vendor. This allows us to look at things like Junos Space,Network Director and Connectivity Services Director to allow us to build service templates that will allow us to provision complex customer solutions and the click of a button rather than jumping onto several boxes and sitting at the cli for 20-30mins. This frees up my time to start looking at the next core network upgrade! P.S. Here’s a pic of our little MX evolution. From bottom to top – MX5, MX10, MX104 and an MX480! This entry was posted in Blog and tagged junos, MX by nickryce. Bookmark the permalink.